This is a 72" diameter stacking Spiral Staircase w/ 30 degree, oak overlay steps (#140). Set in a contemporay town home, this 5 line spiral stair uses 1 1/2" round top rail and 1 1/2" intermediats, connecting to 2" x 1/2" posts, placed every quarter turn giving the spiral rail system its strength. 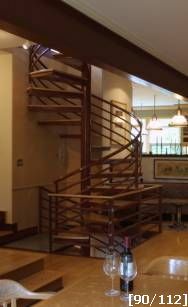 This stacking spiral stair case incorporates a 6" I.D. Scd 40 center, making for a solid, ridgid feel while acending this 3 story unit. Custom painted to match it surronds, this 72" spiral staircase is sure to be the focal point of the space.